When the castle they called home is besieged and ultimately falls, five women are captured and carried off as wives by their foes. 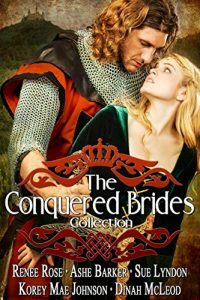 Will they be treated as no more than the spoils of war, or can their new lords prove themselves worthy of the love and submission of their conquered brides? As the ruler of Hohenzollern Castle in name only, Susanna has watched helplessly for years as her power-hungry uncle made one enemy after another for her. One enemy stands out, and the moment she catches sight of him, Princess Susanna is certain that it will be Gerhard of Bavaria who brings her world down around her. As his army smashes through her gates, Susanna makes the only choice she has left. She surrenders herself to Gerhard, hoping to win mercy for her people, though she fears it will come at the cost of her life. But she soon learns that Gerhard has other plans for her, plans which may end with her surrendering much more than just her castle to him. Avowed to never again yield to a man’s ill-treatment, Lady Daisy stands ready to fight to the death when her castle is sacked. The imposing knight Sir Barrett has other ideas, however, and to her dismay, Daisy soon finds herself not only disarmed, but soundly spanked as well. Sir Barrett takes her as his captive bride, but when she shows real terror at the prospect of consummating their marriage, he offers her a bargain. She will offer her body to him and accept the pleasurable torments he inflicts, but he will not claim her fully until she aches for it so badly she begs him. Certain she will do no such thing, Daisy agrees, but can she resist the knight’s seduction? Since her husband’s untimely passing, Lady Natalia has resigned herself to a quiet life as a young widow and perhaps one day as a nun. But when her adopted home is conquered by the enemy, her world is turned upside down. After he rescues her from the chaos of Hohenzollern’s fall, Duke Stefan of Richtenholst cannot imagine allowing Natalia to languish behind the walls of a convent. The duke takes Natalia home as his wife, and he quickly proves himself ready to compel her obedience when it is necessary, but can he ever truly make her his own? When her husband’s repeated infidelities and drunken insults become too much to bear, Lady Cecily flees to her childhood home at Hohenzollern, but things quickly go from bad to worse and she is kidnapped from the castle stables only moments after her arrival. Cecily ignores her abductor’s warnings of ruin about to befall Hohenzollern and his claim that he took her from the castle only to keep her safe. She resists him every step of the way, until at last he spanks her long and hard. Despite his firm chastisement, it soon becomes clear to Cecily that her captor cares for her in a way her husband never did. But can she forgive him for stealing her from her home? Publisher’s Note: The Conquered Brides contains spankings, sexual scenes, and more. If such material offends you, please don’t buy this book.